INCHEON, Oct. 11 (Yonhap) -- South Korean pitcher Oh Seung-hwan said Wednesday he's "open to all possibilities" as he is set to hit free agency this offseason. Oh returned home Wednesday after completing his second major league season with the St. Louis Cardinals. The right-hander went 1-6 with a 4.10 ERA and 20 saves in 62 appearances and lost his closer job in the midseason. This was a down year compared to 2016, when he was 6-3 with 19 saves and a 1.92 ERA and became the go-to ninth-inning guy for the Cardinals in the summer. The 35-year-old clearly didn't help himself in the final year of his first major league contract and acknowledged he had a disappointing season "in all aspects." 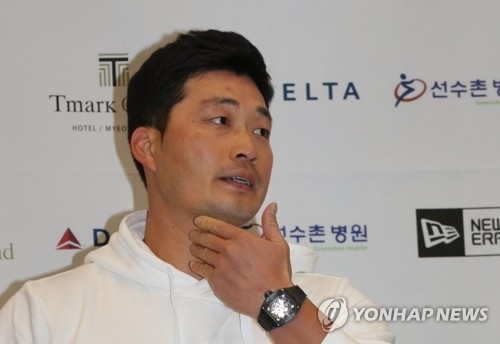 "Whether it's the number of home runs I gave up or my opponents' batting average against left-handed hitters, I had a bad season," Oh told reporters at Incheon International Airport. "But I am not going to worry too much about this. I know what I have to do to get better, and I am going to recharge here and then get ready to pitch again." The left-handed batters hit .333 against Oh this year, compared to .176 a year ago. Oh was touched for 10 home runs in 59 1/3 innings this year after limiting the opponents to just five long balls in 79 2/3 innings in 2016. Oh's strikeout rates also nosedived; he fanned 103 batters last year but only 54 this year. Against this backdrop, exactly where Oh will pitch in 2018 isn't yet clear. Oh said he and his agent, Kim Dong-wook, will have further discussions on his future, adding he doesn't have anything specific to offer at this point. "We'll be open to all possibilities," Oh said. "I'd like to sign a contract that I can be satisfied with." Before joining the Cardinals, Oh spent the first nine years of his professional career with the Samsung Lions in the Korea Baseball Organization. He then had a two-year stint with the Hanshin Tigers in Nippon Professional Baseball in Japan. Asked if he'd consider returning to either of those leagues, Oh only said, "The most important thing for me is to return healthy next year and perform better than I did this year." Oh said this has been a "draining year, physically and mentally," but looking back on his two seasons with the Cardinals, Oh said he was pleased to have finally made it to the majors. "Pitching in the major leagues was my childhood dream, and I was able to play two years without any serious injury," Oh said. "I wouldn't say I am completely satisfied with myself, but I'd still like to give myself a high score. If I have another opportunity to play in the majors, then I'd like to return my fans' support with a better performance."